Ohia Lehua Cottage In Waimea (Kamuela) Hawaii. Just 20 minutes from South Kohala Coast, Hapuna Beach, Mauna Kea Beach. 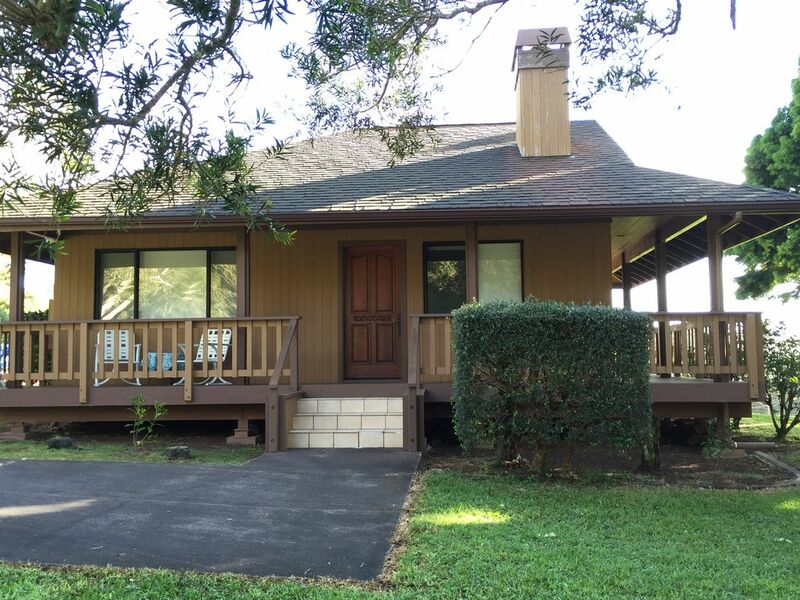 Charming one bedroom cottage in up country Waimea (Kamuela) Hawaii. Elevation is about 2500 feet and provides for a cooler climate. We are also within walking distance of the Saturday Farmers Market. Ohia Lehua Cottage is a one bedroom cottage with a wood burning fireplace, full bath, fully equipped kitchenette. Beach/picnic equipment available upon request(boogie boards, skim boards, snorkel equipment , etc). No smoking inside or outside of this property allowed. All reservations require photo ID at check-in. Wood, kindling etc provided for a cozy fire! We really felt at home! The cottage was comfortable and clean and was well-stocked with just about everything we could need on our trip. The fruit and Kona coffee were a nice welcoming touch. We would definitely consider staying here again! We did have a couple of cockroaches and barely enough bug spray to deal with them. We're from Florida, though, so not really a big deal. Bring your warm robe, it's cold in the mornings (January). The little electric heater didn't do much but the wood stove helped a lot. This is a beautiful property and really well maintained. Ohia Lehua Cottage was our home base for the Waimea area for 4 nights. It was convenient, comfortable, clean and well-appointed. Great sounds of forest frogs at night and birds in the morning! Perfect for three people. Hope to go back! Wonderful climate not hot. Bring warm clothes can be cool at night and early morning. Clean, beautiful location, and close enough to resturants, beaches, and much more! We enjoyed our stay! We loved the five nights spent at the Ohia Lehua Cottage. The location is on a quiet street on the cool side of Waimea and is perfect for exploring the northern end of the Big Island. Nestled among the tall trees that sway and sing in the wind, the Hamakua Coast (with the Waipio Valley and Honoka'a) is just a left turn down the Mamalahoa Highway to the left. Turn right, and downtown Waimea is less than 5 minutes away. Continue about 20 minutes further and you'll get to the Waikaloa Coast beaches and hotels. All the amenities that make the cottage a home away from home were there for us. A microwave and small range with oven, along with all the silverware and cooking utensils, are standing by if you want to cook. (We didn't because we wanted to try all the great restaurants in the area!) A small refrigerator is in the kitchen area for your cold goods. But if you need something bigger, step out the back door and into the attached garage where you'll find a full size refrigerator and stacked washer dryer for your exclusive use. Extra towels, blankets, fans, heaters and even wood for the fireplace are also all provided, giving you options if the temperature is too hot or too cold for you. During our stay, the temps were perfect and we left the windows open almost all the time to catch the breezes. Between the location, the comfortable bed, the awesome shower, the WiFi, and the charm of staying in a home that felt like it was in the middle of a forest, this was a remarkable stay and we hope to return soon!